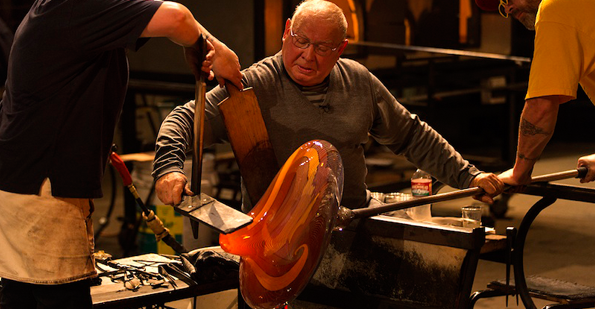 2015 was an exciting year for Museum of Glass. The Museum premiered the never-before-seen Chihuly Drawings exhibition, hosted the US Open’s Bob Jones Award reception, collaborated with the Shanghai Museum of Glass to create new Kids Design Glass pieces, hosted its first Party on the Piazza community festival, and much more! With the arrival of 2016, there are already a few upcoming events that I’m excited for visitors to experience. MOG will open the new, crowd-curated exhibition, #BeTheCurator, on January 16. 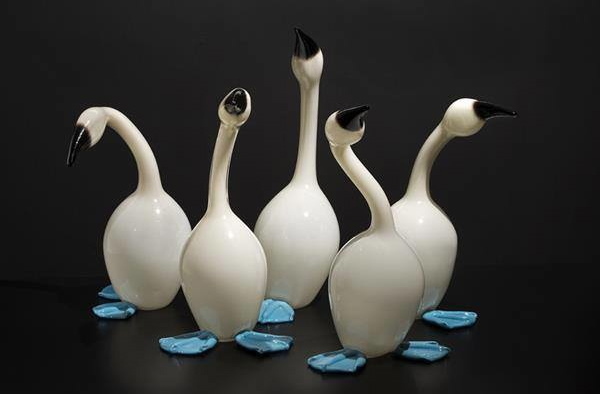 Erich Woll (American, born 1972); Mistakes Will Be Made (blue-footed boobies), 2014; Hot-sculpted glass; Collection of Museum of Glass, Tacoma, Washington, gift of the artist; Photo courtesy of the artist. Last year, Museum of Glass invited visitors to vote for artwork displayed in Treasures from Glass Collectors that they would like to see return to MOG’s galleries in a larger exhibition of pieces from the Museum’s private collection, curated by the public. Visitors were able to vote for three pieces at the Museum, and those who couldn’t visit were encouraged to vote through Facebook with a “like” for their favorite pieces. The social media component had votes from as far away as Brazil, Armenia, the Philippines, Taiwan, and Kazakhstan, and spawned the hashtag-inspired exhibition title, #BeTheCurator. #BeTheCurator will feature the most “Liked” pieces in MOG’s collections, along with visitors’ comments and reactions. I’m excited for the public to see this exhibition because it will continue to include and encourage audience engagement through a variety of components, such as voting boxes where visitors can have their say in which artist featured in the exhibition will receive a Visiting Artist Residency! The Maestro returns! Visitors can enjoy two weeks of Visiting Artist Lino Tagliapietra working in the Museum’s Hot Shop from February 10 through 21. Make sure to save these dates! More details about Tagliapietra’s residency will be available on the Museum’s event calendar soon. I look forward to this event every year because it provides guests with a fun, delicious way to experience glass art! Once again, local restaurants will bring their best burgers to battle for the title of People’s Choice and Judge’s Choice while artist John Miller entertains guests with fiery action in the Hot Shop. Every year, Miller makes a giant glass slider during the event, and every year the slider he makes is different in style (last year, the burger had wings!). So, don’t miss your chance to see what he makes next, sample local food and beer, and dance to swingin’ 1950s hits! Stay tuned for information about tickets and the list of participating restaurants. This entry was posted in Art, Artists, Events, Exhibitions and tagged #BeTheCurator, For the Love of Lino, John Miller, Lino Tagliapietra, Museum of Glass, Slider Cook-off, social media on December 31, 2015 by Museum of Glass. 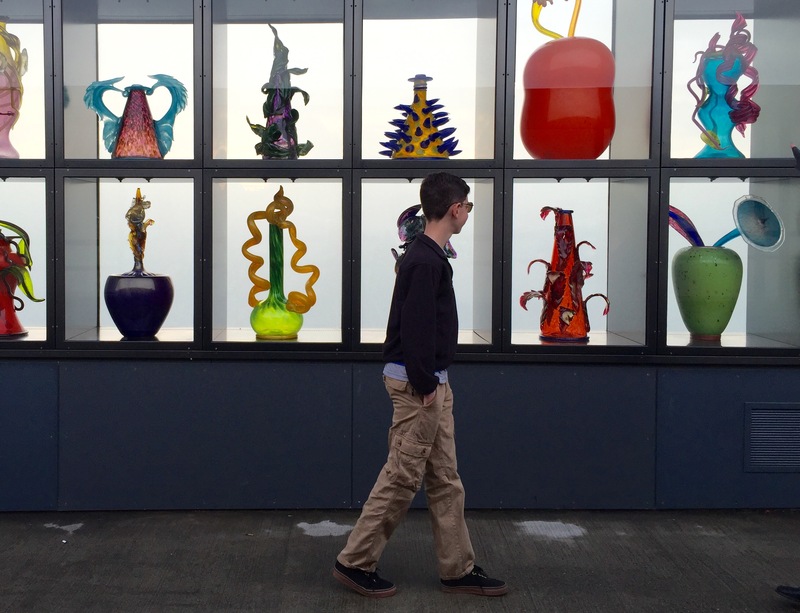 On Saturday, December 5, I entered Museum of Glass (MOG) as an employee for the last time. As I reflect on my one-and-a-half years at the Museum, I can’t help but feel grateful for the experience—it has been quite a ride. As an employee of MOG, I gained a wealth of knowledge about the Museum, the glass community, and its supporters. 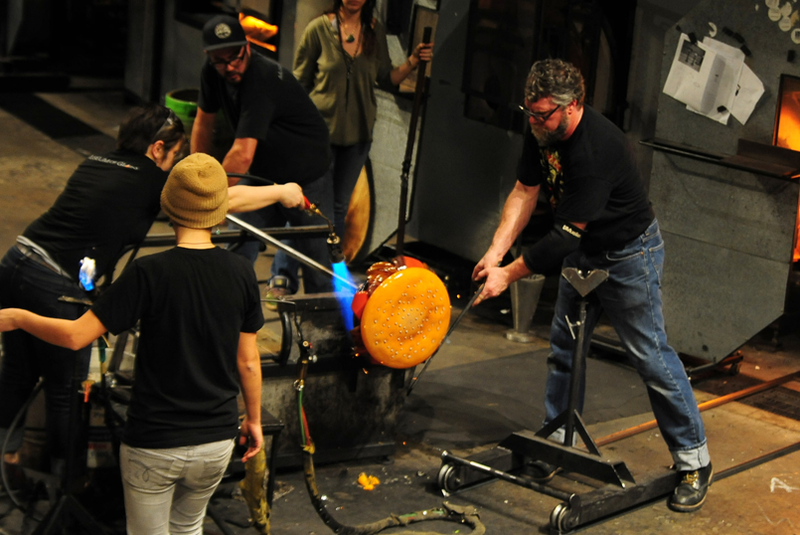 The Museum is such a dynamic, creative institution that really supports and promotes glassblowing, and I appreciate the effort MOG makes in educating the community on the wonders of the art form. I was fortunate enough to expand my role at the Museum, and utilize and develop my skill set in various capacities within MOG; from working in Visitor Services and the Museum Store as a Frontline Associate, to assisting Membership by processing onsite memberships, and finally in Curatorial as a Rights and Reproductions Assistant. The opportunity to work at MOG has been amazing, and without the Museum, I wouldn’t have been able to meet such amazing artists and supporters in person. From shaking Lino Tagliapietra’s hand and having a casual conversation with Flora C. Mace in the Grand Hall, to standing on stage holding works by a number of talented glassblowers for the annual Red Hot Auction, this experience has been beyond memorable. Without MOG, I honestly wouldn’t have been able to have these fantastic encounters and opportunities! Being an employee at MOG is definitely a unique experience; where else can you randomly meet artists and creative individuals that you admire? It was a little bittersweet leaving, as I made some amazing friendships and fantastic memories at the Museum; however, I look forward to supporting MOG as a visitor and seeing how the Museum grows in the coming years! This entry was posted in Museums and tagged Flora C. Mace, Lino Tagliapietra, Museum of Glass, Red Hot on December 18, 2015 by Museum of Glass. Kristin Roberts, Special Events Manager at Museum of Glass (MOG), designed this year’s tree installation at Mary Bridge Children’s Hospital’s annual Festival of Trees. The event took place from December 2 through 6 in the Greater Tacoma Convention and Trade Center. This year, MOG’s tree was decorated with the theme of a “White Hot Christmas.” In addition to the beautiful tree, the Museum’s holiday package included glass goblets handmade by the MOG Hot Shop Team’s lead gaffer, Benjamin Cobb, and a weekend driving experience in a new Porsche 911 Carrera! The trees are auctioned off each year to benefit children and families at Mary Bridge Children’s Hospital in Tacoma, WA. John Ferguson is the Manager of Events and Corporate Membership at Museum of Glass. An aviation enthusiast and private pilot, John enjoys flying out of Tacoma Narrows airport and taking in the beautiful scenery this area has to offer. 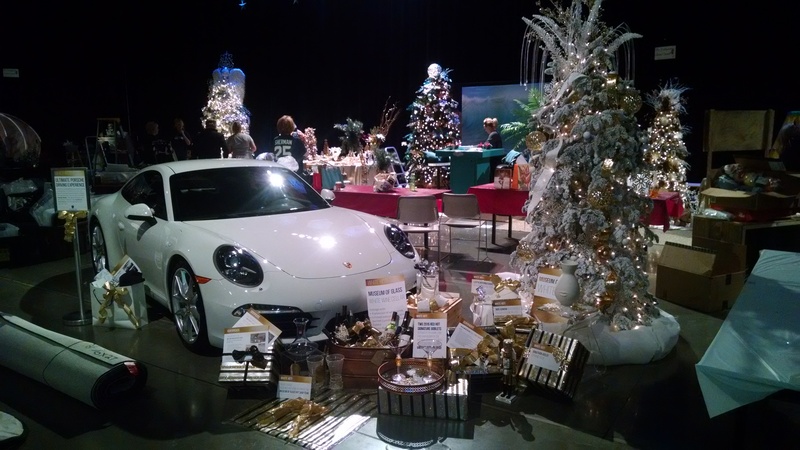 This entry was posted in Art, Events and tagged Benjamin Cobb, Festival of Trees, Holiday Tree, Mary Bridge Children's Hospital, Museum of Glass, Porsche, Porsche 911 Carrera, Tacoma on December 11, 2015 by Museum of Glass. We have a special story to share with you today. 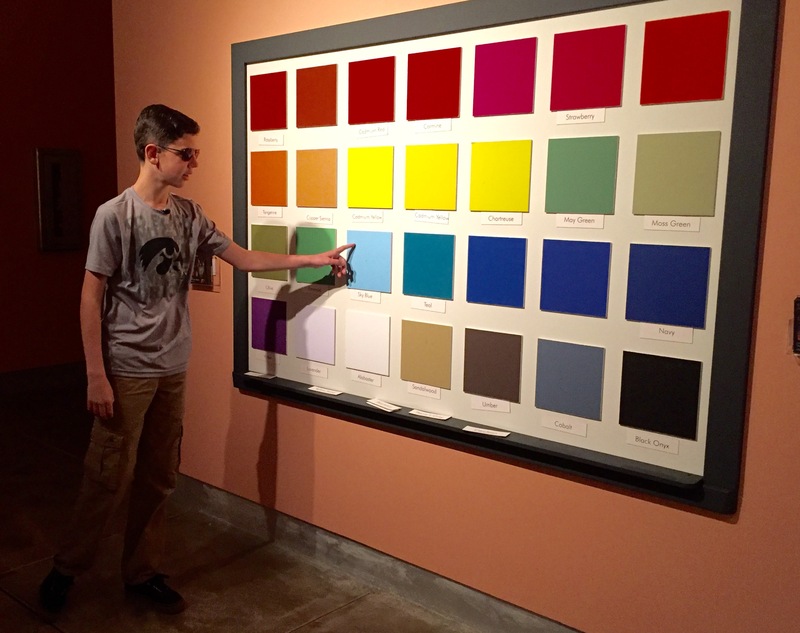 This morning, 13-year-old Eli, a student at Jason Lee Middle School, saw color for the first time at Museum of Glass. Eli is colorblind, but that changed today thanks to a unique pair of glasses from EnChroma. EnChroma’s color blindness glasses have been featured on the Today Show and CNN Money. Recently, the company hosted a contest to give away glasses to children with color vision deficiencies. The company received almost 200 entries. Eli was one of around 50 children who were selected to receive EnChroma’s glasses. In the video Eli submitted as part of his application, he shared what he hoped to accomplish as an adult, as well as how seeing color would impact his current interests and hobbies. As a soccer player and referee, Eli knew that seeing color would help him better navigate the field and distinguish soccer teams’ different colored jerseys. Eli also knew the first place he wanted to go if he won the glasses. He originally told his mom that he wanted to experience color for the first time at the tulip fields; after realizing this would not be possible in winter, he knew where he could go to see color, no matter the season—Museum of Glass. He arrived at Museum of Glass with his mom and sister as soon as the doors opened, EnChroma glasses in hand, eager, but nervous, to see how the glasses would change his vision. After some discussion about what he should look at first, he decided to head to Cappy Thompson’s Gathering the Light in the Museum’s Grand Hall. Eli had been told that it can take about 15 minutes for eyes to adjust to the glasses, but as soon as he put them on, he noticed changes in his vision. Eli and his family moved into the Chihuly’s Venetians exhibition, where he approached the Color Matching wall. Eli had never seen the color of his bedroom wall (without the glasses, it looks grey), so his mom took this opportunity to point out the color. Eli, seeing different shades of blue. “That’s the color your room is,” said Eli’s mom, Mary, pointing to a vivid green. “Really? That’s really bright. I didn’t realize it was that bright,” replied Eli. 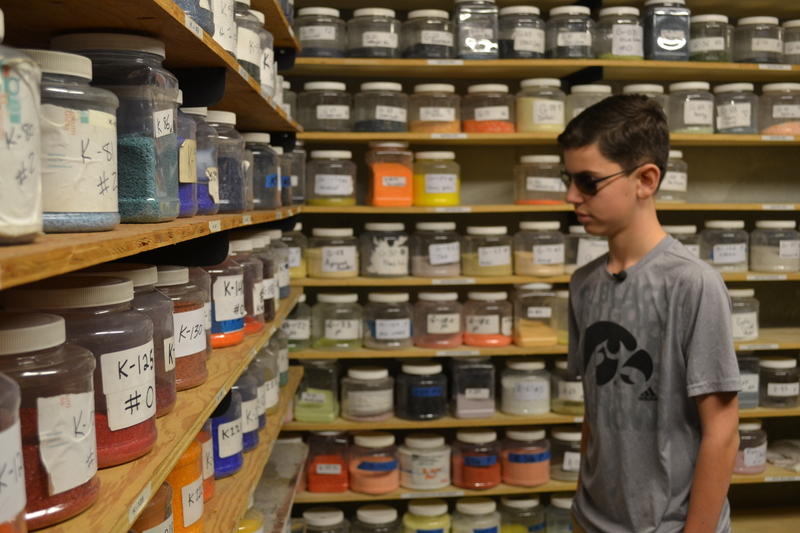 Eli also had another opportunity to experience the many shades of color in the Hot Shop’s color room, where colored powders and canes used by the Museum’s Hot Shop Team are stored. Eli in the Hot Shop’s color room. The colorful morning ended outside on the Chihuly Bridge of Glass, where Eli briefly took off the glasses to compare how his eyes adjusted with and without his new specs. Eli on the Chihuly Bridge of Glass. Learn more about Eli and his EnChroma glasses on KIRO Radio and KOMO News, as well as in The News Tribune! This entry was posted in Art, Glass, Museums and tagged Cappy Thompson, Chihuly Bridge of Glass, Chihuly's Venetians, colorblind, colorblindness, colorblindness glasses, EnChroma, Jason Lee Middle School, Museum of Glass on December 5, 2015 by Museum of Glass.